Port Vale have released defenders Kris Taylor and Matthew Bell after deciding not to offer the pair new contracts. 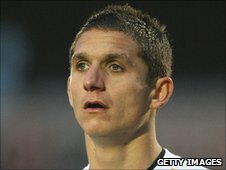 Taylor, 27, joined on a free transfer from Hereford in August 2009 and played 74 times for Vale, scoring four goals. Bell, 19, came through the youth system at Vale Park, but failed to make a first-team appearance for the club. Meanwhile, BBC Radio Stoke understands midfielder Gary Roberts and utility man Ritchie Sutton have been offered new deals by returning manager Micky Adams. Both players arrived at the League Two club at the start of last season, before Adams left Vale to join Sheffield United. Former Crewe trainee Roberts, 24, played 43 matches in his first year with Vale, scoring twice, while Sutton made 13 appearances without scoring. Vale have already agreed new contracts with full-back Adam Yates, midfielder Doug Loft and centre-back Gareth Owen, who will combine playing duties with his new role as manager of the club's reserve team.